In partnership with the Fallsview Tourist District and the Yerich Family, we are pleased to illuminate Niagara’s iconic tower – the Skylon Tower. 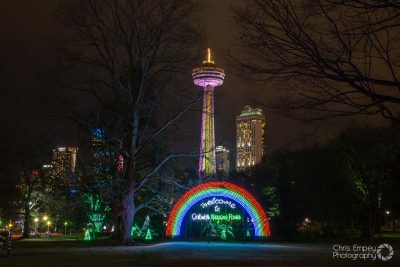 Using the latest lighting technologies, the Skylon Tower is illuminated using 12 RGB wash fixtures and projectors along with 3 image projectors creating a fantastic nightly lighting spectacle. Countless hours of logistical planning and programming, led by Spectral LV Lighting Systems, have gone into developing the new computerized light show for Niagara’s iconic 520 foot tall Skylon Tower.